Created in conjunction with Zaha Hadid's lecture and discussion on 24 October 2014. This guide was originally created for Visions and Voices. 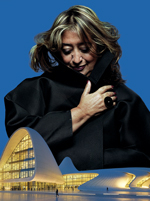 Zaha Hadid, a Visions & Voices event, is scheduled for Friday, 24 October 2014 in Bovard Auditorium at 7 pm. Admission is free, but reservations required. RSVP at the links below beginning Friday, September 26, at 9 a.m.
For event details, go to www.usc.edu/visionsandvoices.